I had hoped that, with Daniel Galmiche taking over from John Campbell at the Vineyard, the standard would not have gone into a freefall, despite the loss of 2 Michelin stars due to the departure of Campbell. The evening started off well (well, the restaurant anyway, the hotel is another story which will be covered in another post) with the Vineyard cocktail (Mandarin essence with champagne) complimentary from the head chef – merci beaucoup Daniel! 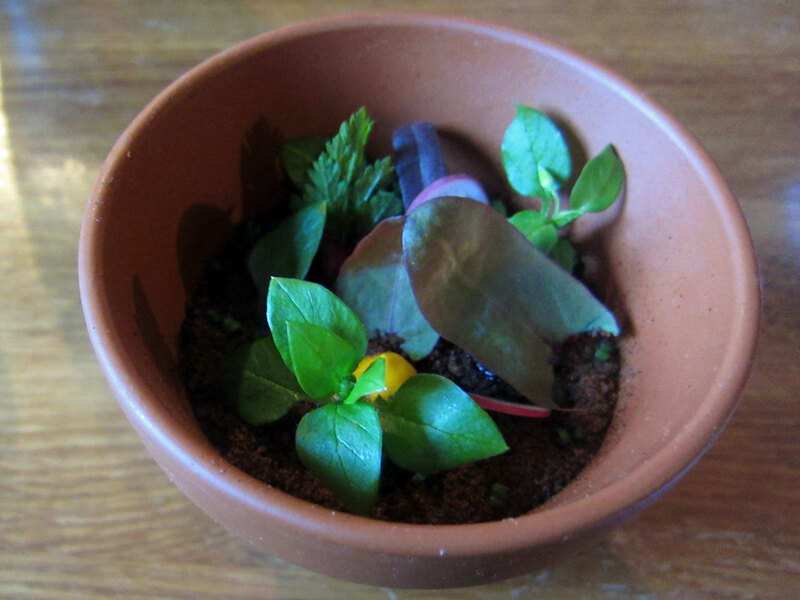 While there is nothing fundamentally wrong with the food, the front-of-house service was a complete letdown. The wine sommelier was not knowledgeable and she gave the impression that she wanted to be elsewhere other than at the restaurant. When asked for advice for wine (esp for an alternative to Chablis), she was so unhelpful that I might as well close my eyes, open any page of the wine list and select one randomly – when we posed the question “so, what’s this wine like?” and she said “oh, it’s nice.” I could have given that answer myself! For God’s sake, if the wine is not nice, you wouldn’t have included it in the wine list in the first place surely. So we ended up having a bottle of Chablis because of this. The presentation of the wine list was a complete joke – a stack of spiral-bound paper that look as if it came from a small home office! The waiters and waitresses were OK but there’s a lack of personal warmth and welcoming touch to the whole experience. The decor of the restaurant was very much the same – it’s a restaurant but it lacks that level of intimacy I expect with this class of restaurant. 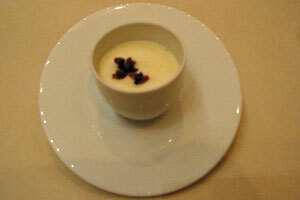 (1) Veloute of lentils, smoked bacon espuma – it was a pleasant surprise to find the flavour from the edge of the dish differed quite a bit from the centre of the dish. It was thick and full of flavour. 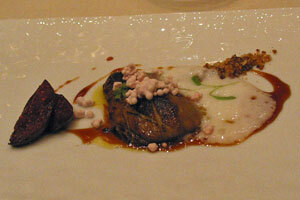 (2) Frisee salad, shavings of Iberico ham and foie gras – The presentation of the bite-size ingredients was good, though I thought the foie gras would probably look better as small cubes. The salad could have done with a bit more olive oil dressing as it was a bit on the dry side. (3) Pan-roasted diver caught Scottish scallops, caramelized endive, autumn salad – “what scallop”, “large and chewy, lacking in scallop flavour” were 2 of the verdicts I have received back from my guests. I thought the scallop was overcooked. 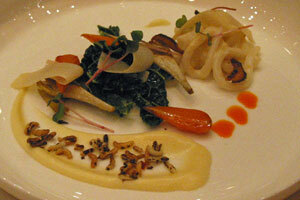 The endive was sweet and strong in flavour, and maybe that’s too overpowering for the delicate flavour of the scallops. 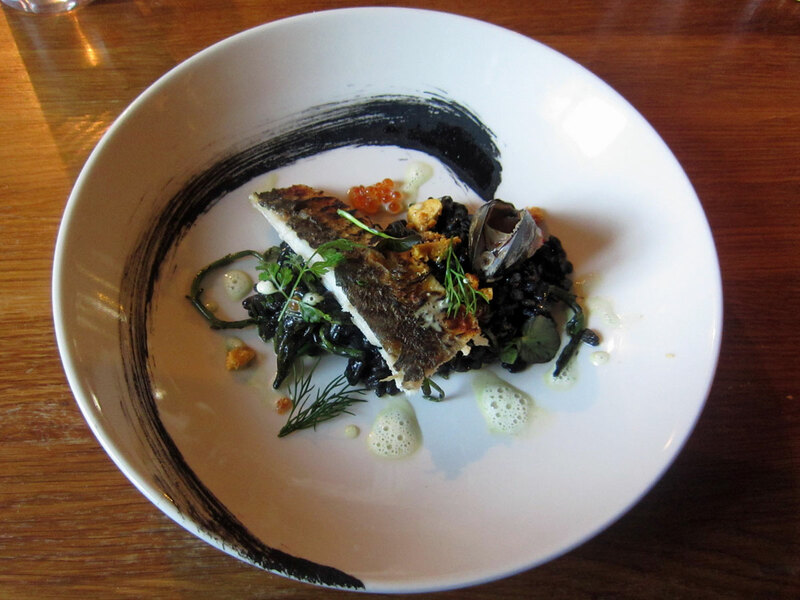 (4) Steamed fillet of John Dory, honey and chilli glaze, Jerusalem artichoke – this was Daniel Galmiche’s signature dish, and it did not disappoint. I was a bit worried that the chilli glaze would be too strong for the fish, but he got it just right, The highlight (amongst a number of the lowlights) of the evening. 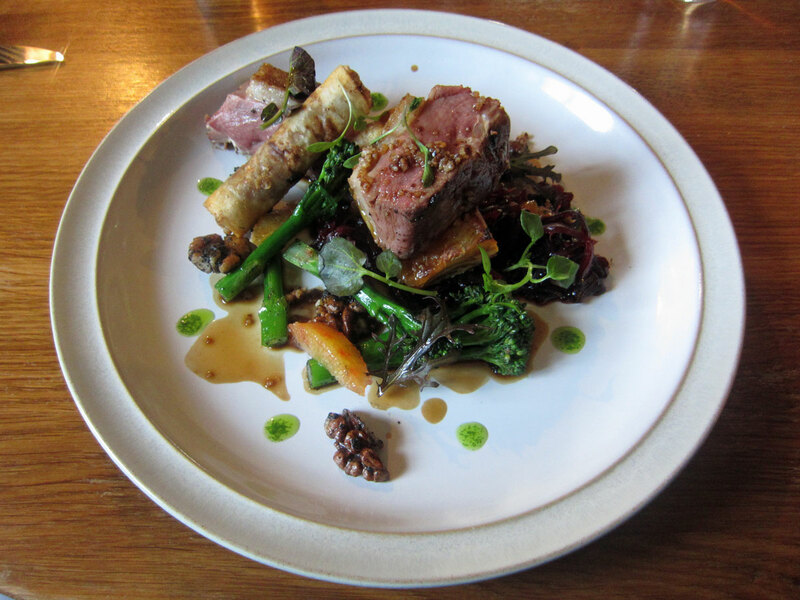 (5) Roasted fillet of Balmoral Estate venison, salsifies, butternut squash puree – The presentation of this dish was beautiful and looked more like a dessert than a main course. However, the venison was tough enough that we should have had steak knives to cut the meat. 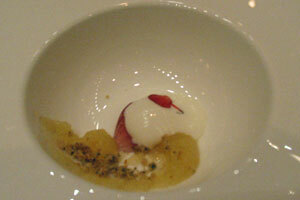 (6) Fromage blanc, Granny Smith, Calvados sorbet – Another dish that excelled in the presentation. 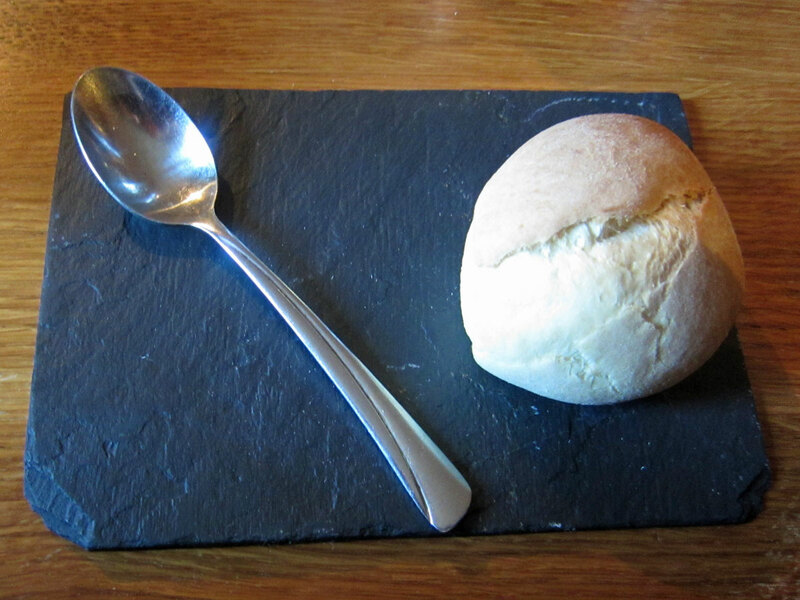 As much as I hated fromage blanc usually, I actually liked this. 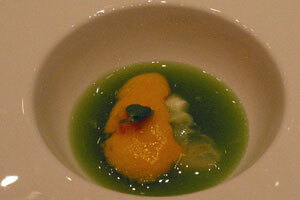 The downside was that the alcohol flavour in the sorbet was too much that it dominated the other flavours completely. A shame really. 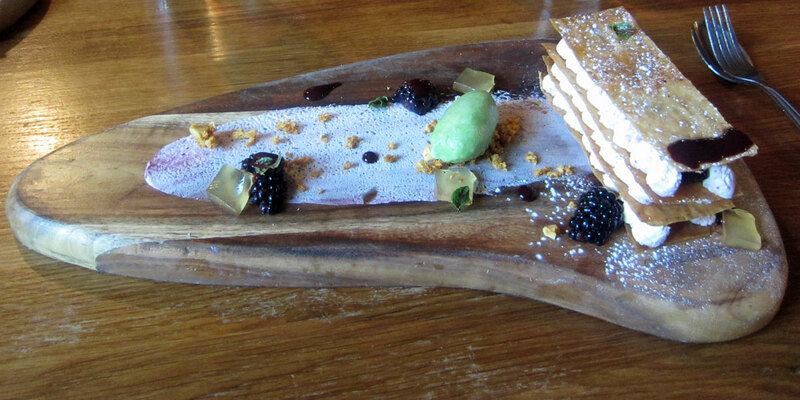 Also we were a bit puzzled that this dessert was served in March when it would be more suitable as a hot summer dessert. (7) Passion fruit, banana and white chocolate – the sweetness of white chocolate went well with the rather strong sour taste of the passion fruit. Now the question is – will I go again? 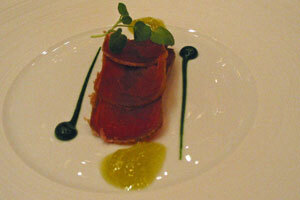 I may, but I can think of Michelin-starred restaurants that are better value for money at the moment. Daniel only took over the restaurant in October 2009, and so maybe he needed more than 5-6 months to get the place back on track. On the website it says “The Vineyard at Stockcross has triumphed in the National Restaurant Awards, scooping the Hotel Restaurant of the Year title and securing the No.6 spot on the list of the UK’s Top 100 restaurants.” – at this rate Vineyard has a lot of work to do if they are even contemplating of keeping these titles in the 2010 surveys! 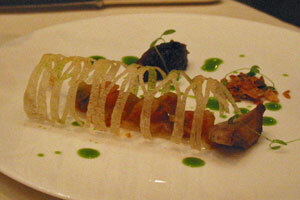 One of the main gourmet anticipations for me in 2010 was a visit to John Campbell’s new restaurant at Coworth Park. Since early summer 2010, I had been monitoring the opening date for the hotel and restaurant. It finally opened in September 2010, and since I was planning on a gourmet holiday in November with Darcy and Bob (who were mad enough to fly over to the UK the second time in one year to go on a UK gourmet holiday), I ended up booking a table for November to go there with them. Calling the reservation was a bit of a chaotic affair when I rang towards end of September, but then it could be forgiven when it’s only just opened for a few weeks (though on the other hand, this would not really be a good excuse when it’s part of the Dorchester group). Still, I managed to secure a table on the date I wanted without any problem – obviously this place was still not on many people’s radars. There were simply way too many dishes we wanted to have on the a la carte menu, and so in the end we chose to go for the tasting menu. There were the non-vegetarian tasting menu as well as the vegetarian tasting menu – you’d think it would be easy to decide with just these two choices, but it’s tough. So in the end Darcy chose the vegetarian menu, while Bob and I went for the carnivore version! 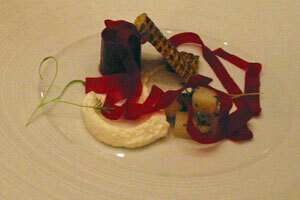 1st course: Parsnip Soup, with Oxtail and Purple Cauliflower – the vegetarian version had the oxtail omitted. 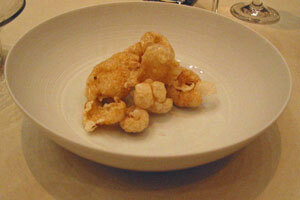 This opening dish was delicate and flavourful. 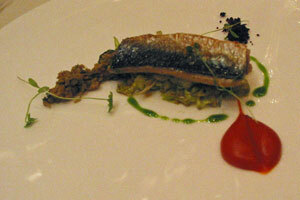 2nd course: Pilchard with Tomato Jam, Lettuce and Tapenade – Not being a fan of pilchard, this dish was out of the world deliciously good, and Bob was speechless as he enjoyed it so much too. For Darcy, the only word she managed to utter on her Aubergine with Cheese Sauce & Chutney was “wow”! 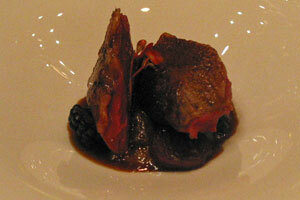 3rd course: Pigeon with Pumpkin & Apple – we thought the last dish was good, but this one was even better. The meat was very tender and bursting with flavour. By the end of this course for Darcy (Beetroot with Salad, Potato & Goats Cheese), she had already decided that this was the best vegetarian menu she’s ever experienced. 4th course: Dried Tuna with Olive Oil, Beetroot & Watercress – This dish sounded so interesting that Darcy actually requested to forego her vegetarian dish and replace it with the tuna also. Perhaps we were expecting too much, so unlike the previous dishes, this was the first dish which we would refuse a second plate even if we were offered another plate of the same food. 5th course: Foie Gras with Muscat, Pecan & Parmesan – the fig and foie gras combination worked really well, though I found the foie gras slightly overcooked – Bob disagreed as his was perfect, and he liked the contrast of the hot and cold flavours in the dish. 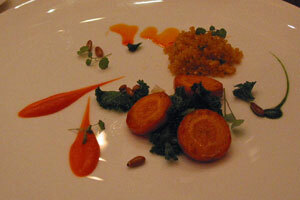 The presentation of Darcy’s Carrot with Galangal Ginger & Pinenuts was absolutely beautiful, though it looked better than it tasted – that’s not the say that it’s not a good dish as it was cooked just right. 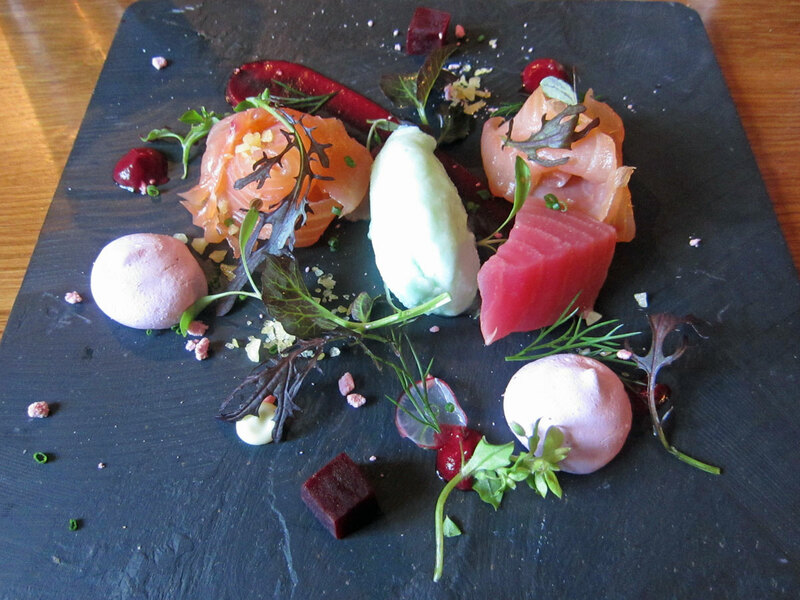 It would be very difficult to beat the contrast of such vibrant colours in one dish. 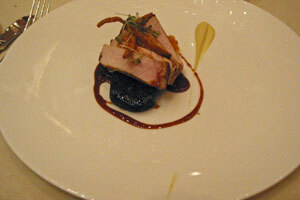 6th course: Pork, roasted with Bacon and Sage – the pork on its own would have been a bit too dry, however when it was combined with the black pudding and swede mash, this added the need moisture and the dish worked like magic. The vegetarian Palm Heart with Chilli & Noodles did not seem to excite Darcy’s tastebud – her description of the dish was “forgettable”, with the noodles being a bit on the gooey side. The other ingredients on the plate was nice enough to save the dish. 7th course: Bramley Apple & Sage – as this dish contained alcohol, Bob had the alternative Mango Sorbet & Cucumber Soup which was refreshing and he said it resembled a tonic and he felt so healthy eating it. For the apple and sage, Darcy and I were pleasantly surprised by how simple ingredients could have made this into a great dish: the smooth silkiness of the apple puree blended nicely with the sage and vanilla. 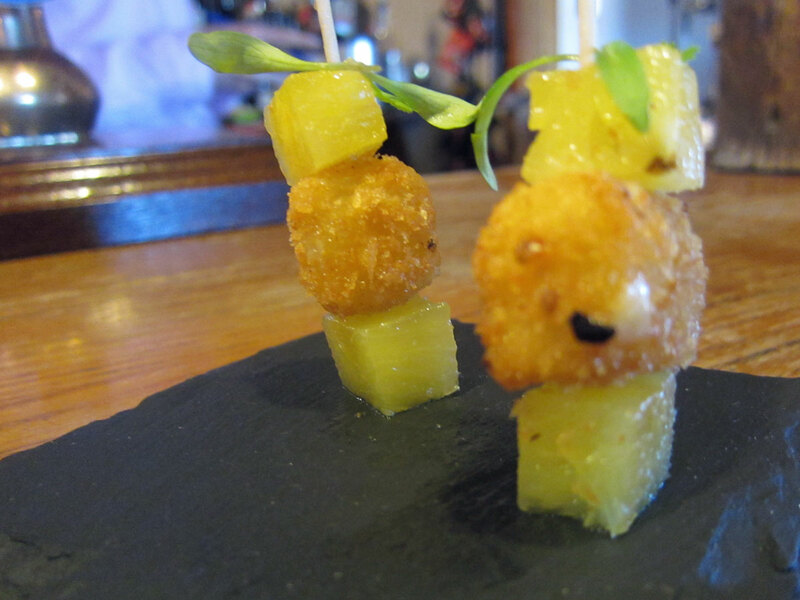 The dish was so full of flavour, and the texture was elevated with a sprinkling of biscuit crumbs. 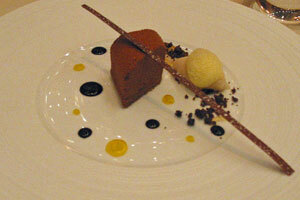 8th course: Chocolate Bar with Beer ice-cream & Lime / Chocolate Bar (non-alcoholic version). 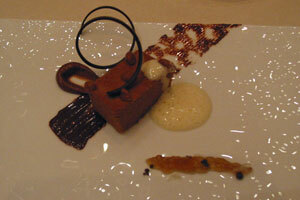 Some chefs tend to go a bit heavy-handed when it comes to chocolate dessert, but not at John Campbell’s. The intensity of the chocolate was perfect. 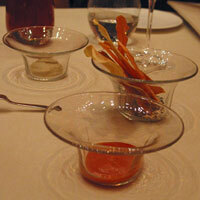 We all agreed that we would quite happily have this dish again. 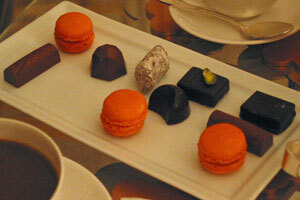 After dinner, we opted to go to the drawing room for our coffee and petit fours. There was a draught where I sat and so it was not as comfortable as I would have liked, but the petit fours took my mind off that quite quickly. On the whole, this was a very nice restaurant and the price was very reasonable for this high standard. However, I suspect that when the awards start flooding in in the near future and more people are aware of this place, the price will go up and the reservation will become more of a nightmare. We were certainly glad to have gone there, and we would happily return for another meal.